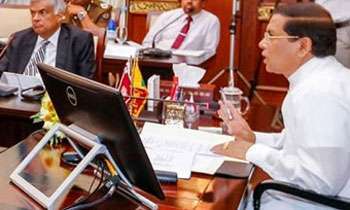 President Maithripala Sirisena has summoned a special Cabinet meeting today at 12.00 noon at the Presidential Secretariat, sources said. Accordingly, the Presidential Secretariat had telephoned all ministers and asked them to mark their presence at the meeting. However, the reason for the meeting is unknown. may be to discuss the quality of the cashew nuts served by Sri Lankan airlines ! THE REASON IS TO INQUIRE WHY HE IS GIVEN STUFF TO EAT WHAT EVEN DOGS DON'T LIKE TO EAT. hope president reads this - re-shuffle cabinet ministers - assign mininstries in a logical manner - education to link with employment/ vocational training and science etc. power to link with environment. agriculture to link with plantation industry and forests etc. so that there would be a proper coordinations and to avoid conflicts between ministers. Cabinet meeting would not solve pressing problems of people. Sack the whole cabinet and appointment a Cabinet of 20. Competant people. Or dissolve Parliament and have election. totally agree. non-party independent competent people to run the country. Suggest that the prez sack himself too together with the ministers. is it about the food in the canteen? is it the peanut case? Maybe the daily paper deliveries to the presidential secretariat has stopped, and he wants to appoint a commission to investigate it? To get there experiences on food served on airlines!!! To discuss the milk packet issue and to know why Namal baby was not given one!! !